The Final Exam is now open. Please be sure to look at the Study Guide first so you can be successful on your Final Exam. Also, remember that you must complete this in one sitting so it doesn't time out. If it freezes contact me as soon as possible so I can reset it. Only 10 more days left! The last day of the semester is Friday, May 20. 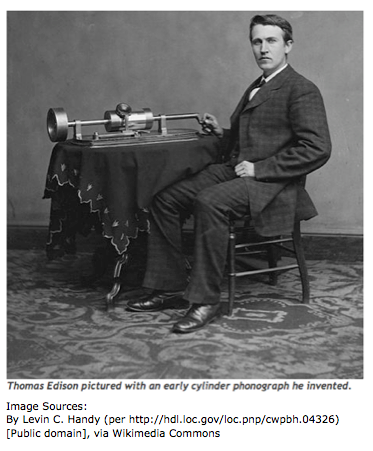 In 1877 Thomas Edison really began the music technology world as he patented the cylinder phonograph. This was the first technology that could record sound. It is hard to imagine that all of our recorded music began 135 years ago! I wonder what Edison would think about Spotify and mp3s today?